We love the casual and rustic style and feel of Moofushi – this really is a place where you can ditch your shoes on your arrival and enjoy all the sand floors everywhere! One thing has always frustrated us about Maldives resorts – quite bizarrely, as resorts become more luxurious and expensive, so less and less is included in the price! In fact, many of the really top-end resorts in the Maldives include breakfast only in their rates – and you’re then left to purchase all the rest of your meals and drinks at prices that would make even a Russian oil billionaire’s eyes water! Recently though, a few new premium resorts offering the type of All Inclusive packages so beloved of South African travellers have opened their doors – and the new Constance Moofushi is perhaps the one which excites us the most out of all of them! With its reef-fringed azure lagoons, powder white sandy beaches and wonderful house reef, Constance Moofushi’s natural beauty is paralleled by the highest standards of service and quality and is rapidly attracting a host of rave reviews from delighted guests! The décor here isn’t the highly contemporary but often quite anonymous luxury stylings common to many of the latest top-end resorts – instead Moofushi has a charmingly rustic yet very funky and modern feel. Natural materials such as bamboo and wood work beautifully in conjunction with upmarket uplighting in the rooms and bang-up-to-date furniture in the public areas. Combined with the open wooden decks and extensive sand floors it all creates a feeling that this is what Robinson Crusoe would have come up with if only he had been an interior designer! At Moofushi you have a choice of 110 well-appointed villas, all of which boast such modern day desirables as complimentary Wi-Fi, a flat-screen television, iPod docking station, a Mac mini entertainment system, movies and music on demand, lounge area as well as shower and terraces – there are 24 Beach Villas (57m²) if you fancy walking out of your room straight onto sand; otherwise there are 56 Water Villas (66m²) on stilts over the water as well as 30 even more spacious Senior Water Villas (94m²) which also boast an outdoor bathtub and hammock. Good news for families is that Moofushi also allows children under the age of 12 to stay in the water villas (most resorts don’t allow this) with the Senior Water Villas accepting up to 2 children on extra beds. Compared to similarly priced rivals we find the rooms at Moofushi both more spacious and appealing - we love the funky “pod” lights in particular! As mentioned earlier, South Africans love All Inclusive packages and the good news is that Moofushi has this as standard for all guests – the better news is that their “Cristal Plan” is one of the best of the All Inclusive packages that we have come across! Not only does it include all meals in the lovely sand-floored Manta restaurant with its huge range of delicious dishes, it also throws in one dinner at the stunning à la carte Alizée beachfront grill which is located just a few steps from the ocean and specializes in fresh seafood and grilled meats. 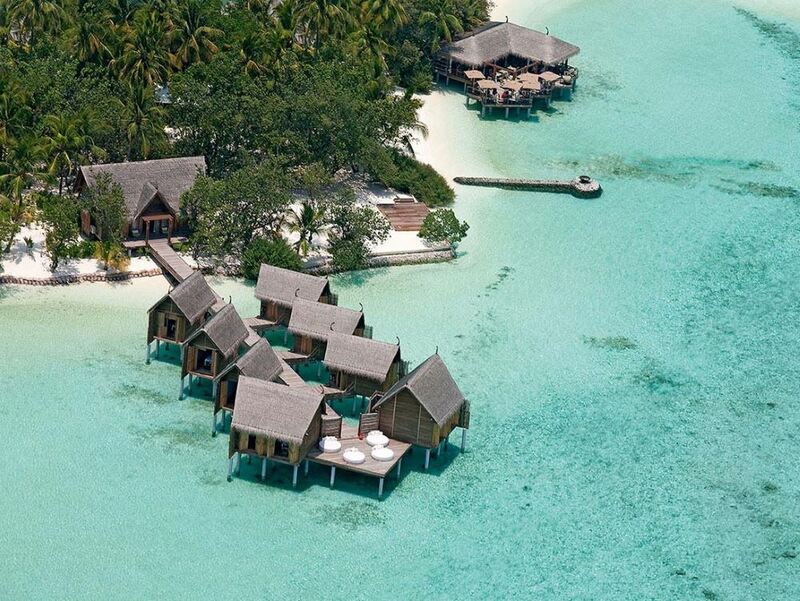 Unlike so many AI plans at Maldives resorts, this one offers a huge selection of international wines of excellent quality – and there are excellent and very friendly sommeliers who will advise you on the best wine matches for whatever it is that you are eating. Afternoon tea and pancakes are offered at the gorgeous Totem Bar next to the pool every day whilst the mini-bar in your room is also covered - smokers even get free cigarettes as part of the package! What we really love about the restaurants and bar areas at Moofushi is the way they combine the casualness and rusticity of sand floors or wooden decks with some decidedly stylish furniture and décor elements – it all adds up to a wonderfully cool yet casual vibe where you can enjoy exotic cocktails along with shisha pipes! And whilst it’s all very casual in ambiance, the service from the staff is consistently raved about – this is definitely a place to come if you’re looking for some serious spoiling! 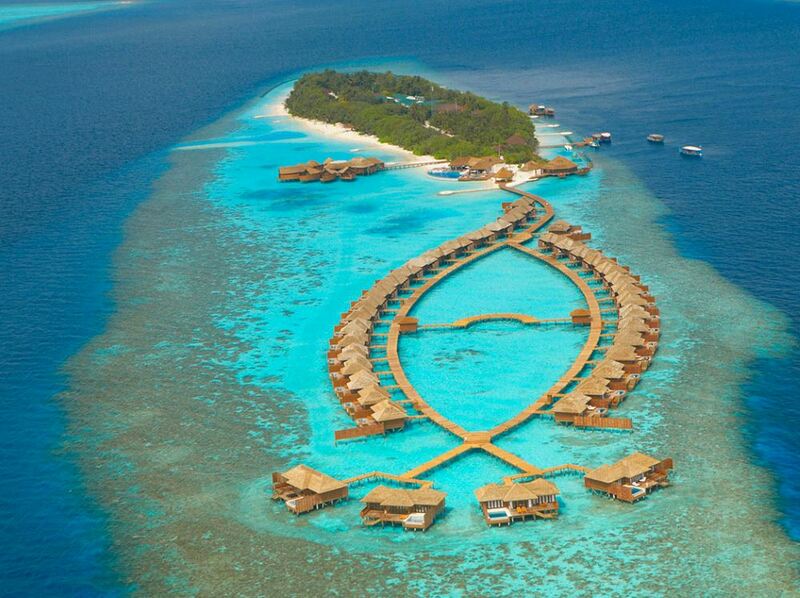 When it comes to the natural beauty of its surroundings, Moofushi has certainly been blessed in abundance. It boasts stunning white sand beaches forming a gorgeous contrast with the lush green foliage of the island as well as an excellent house reef so guests can enjoy stunning snorkelling right off the beach – spectacular coral gardens, loads of colourful tropical fish, reef sharks, turtles, small rays, and the odd octopus are all on display! The Cristal Plan also includes a boat trip excursion on a traditional dhoni, whilst back on the island you have the use of a small but well equipped gym. Otherwise head for the Spa for a relaxing massage where you can relax whilst also checking out the marine life swimming below you through the glass floor. It all adds up to a resort that combines Crusoe Chic barefoot elegance with great personal service, superb food and a excellent value for money All Inclusive package – what’s not to like!